How much control should kids have over their money? The January edition of our series, Teaching Kids about Money, tackles the most basic concepts, earning & using money. Last week, in Part One, we looked at the different ways kids can get money. If you missed Part One, please pop over and take a look at it. Today, in Part Two, we are going to talk about how much control kids should have over their own money. What can they do with the money once they have earned it? When do you start letting your child make decisions with their money? Letting your child make spending decisions can make some parents uneasy. It is difficult to sit back and watch your child buy a toy that could very well be tossed in the back of the closet in a week or two. We don’t want our kids to be wasteful so in an effort to teach saving, we remove their ability to spend their money or even make decisions with it. Now I am not promoting that we give our kids carte blanche with every penny. However, I do feel that they need to be able to have some control over some part of their money so that they can use it and practice managing their own saving and spending. The amount of control and the amount of money will vary depending on the age of your child and their experience level with money. The key is that kids become actively engaged with their money so that money management becomes a relevant part of their life. Set parameters: If I gave my 8 year old total, 100% control over his money, he would spend his life savings on bubble gum. I don’t really want to pay the resulting dental bills so his father and I reserve the right to veto a potential purchase. Setting parameters and communicating those parameters allows the child or teen to have control within the family’s guidelines. For example, my teen son is pretty good about saving his money for specific items. He has purchased his own cell phone and iTouch. However, there are certain video games that we will not let him get, even if he has his own money. It is entirely possible to have rules but still let a child/teen choose how to spend their money. Let your child make mistakes. This is a tough one. No parent wants to see their child buy their 26th stuffed animal or purchase a toy that will break within a week. However, allowing a child to live with the consequences of their choices can create important learning situations. If your child impulsively spends their allowance on a new toy and then regrets it two days later, perhaps he will learn to be more thoughtful with his money. If your daughter babysits the neighborhood kids and saves the money for a new bike, perhaps she will learn the value of saving for a goal. It is important to talk with your kids a week or so after a purchase to see if they still think the decision to buy the item was a good one or not. Consider a structured access to spending money: If you do not want your child to have access to all of the money that he earns, consider dividing his income into categories so that he only has access to a percentage of it. The Save Spend Share approach is a common technique. Money is divided into three categories and the child has the ability to use what is in the Spend category. The child still gets to practice using some of the money. When regular conversations about saving and spending are coupled with active experiences with money, the beginnings of true financial literacy can happen. 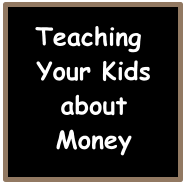 Don't miss the February edition of Teaching Your Kids about Money where we will discuss getting kids to grow their money. Subscribe with the email or RSS links above. Andrea - Right there with ya! My 15 year old bought a video game a few years ago that was supposed to be the coolest thing ever. I think he paid $50 - $60 for it. Turns out that he wasn't so impressed with it and later resold it to a store for about $15. Talk about a learning lesson! Leanne - My kids often have to go through a "cooling off" period before they make a purchase. At least half the time, they decide not to buy the previously desired toy. Delayed gratification is a great thing to practice! Nice blog article! I'm a mom of four myself so I totally get your perspective. I'm a fan of giving them 100% control and letting them fail before coming in with regulations. As long as they do not buy things that you're 100% opposed too this is an effective way to learn about money. The first mistake will be very hard on them so get ready for the water works. 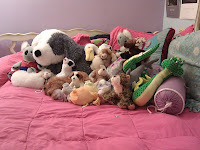 YFS - My daughter bought a battery operated sewing machine when she was about 9 years old. She had saved for about 6 weeks for it. After just a few days, she hated it! It was difficult to use, she couldn't make Barbie doll clothes and the needle kept bending. She asked me for her money back. I told her "No" and the water works and drama began. I wanted so badly to fix it and "make it all better" but I stuck to it. It was tough lesson but a good one. If the parent becomes an ATM, the kid doesn't learn too much about money management! Mind you, nothing helps their arithmetic like adding a currency symbol to the numbers! John@MoneyPrinciple -- HA! So true. Now if I could just find a way to make algebra more meaningful for my 6th grader! Love these tips. Financial or otherwise, sometimes you just have to let them learn the hard way... isn't parenting fun? Shaun @Money Cactus - It's definitely a roller coaster but I wouldn't trade it for all the money in the world! They keep life interesting and just when you think you have it figured out...boom - they hit you with something new! It's fun to hear the young ones let you know they are getting it when they bring up a tidbit you've left with them. Thanks for sharing - Yakezie! My parents used a combination of different methods, and I really wish they hadn't sometimes. But it is how we learned how to deal with money.